This release contains quite a few improvements and will be the last release for a couple of weeks while I work on adding ACOM2000A support. As I have limited access to an ACOM2000A now i’m expecting this to take around 2 weeks to complete. ACOM Director Plus can be installed side by side with the original ACOM Director software. I would be particularly interested in hearing from anyone with an ACOM1200S as i’m unable to test with this amplifier. This release will be the final Technical Preview release as i’m now working on the initial alpha version. 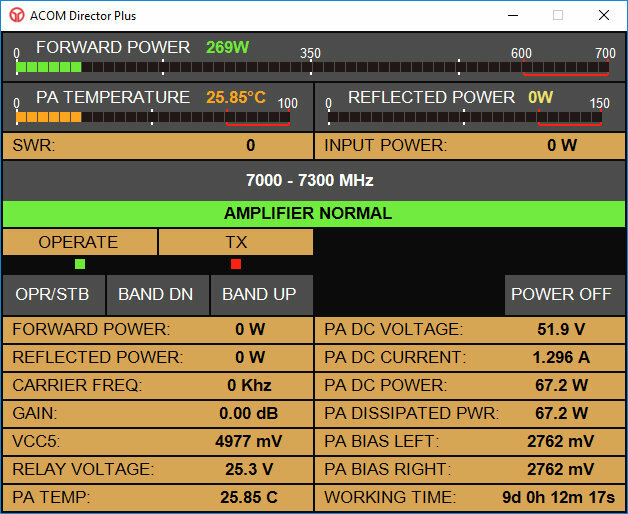 I would be very interested in receiving any feedback regarding ACOM Director Plus. 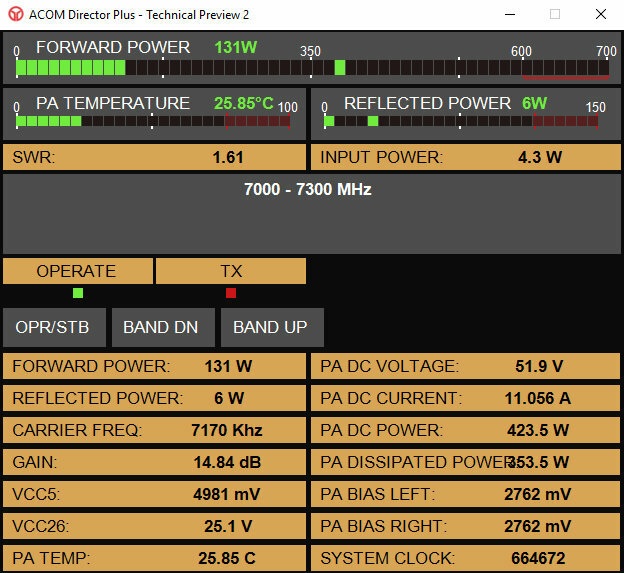 ACOM Director Plus Technical Preview 2 is now available for download. Please see https://www.m0yom.co.uk/acom-director-plus-technical-preview-1/ for details on the Technical Previews i’m currently releasing. This version adds a whole new user interface which whilst it’s far from the final one is very indicative over how it will look. It is also fully functional in terms of monitoring the state of the amplifier and providing Operate/Standby control as well as band change control. As with Technical Preview 1, this has no installation routine, you simply run the self extracting download and launch the “ACOM Director Plus.exe” file. An update on ACOM Director? surely not. As many of you will have noticed, i’ve been somewhat silent for a while on the new version of ACOM Director, this has been down to a number of reasons, some personal, some work related and some due to some technical challenges getting it to do what I wanted it to. Personal and Work issues aside, ACOM Director has been through 2 entire re-writes since the last update I posted, I won’t go into all the underlying reasons, however i’m now happy with the approach i’ve taken which will allow some exciting capabilities in the future. 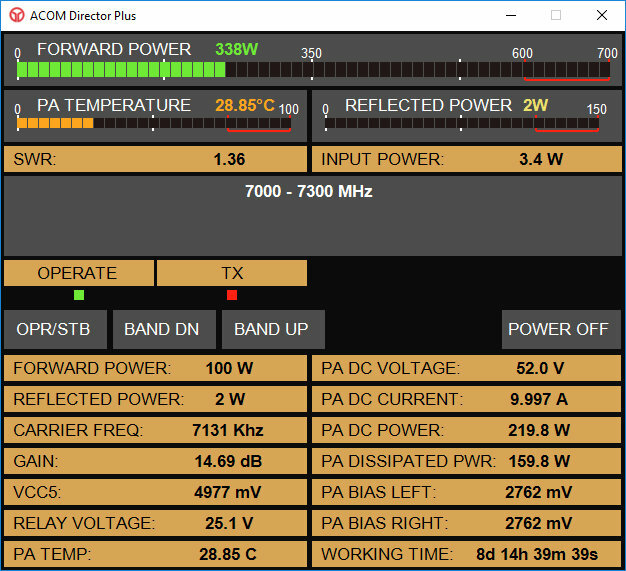 ACOM Director has now been re-written from the ground up and as such i’ve decided to create a whole new version which i’m calling ACOM Director Plus. Just a quick update as a number of people have been asking about the progress on the new ACOM Director version 2. I had hoped to have it completed by now, however work and life commitments have meant that progress has been slower than expected. However I am now able to dedicate 2 days a week to working on it so things should get moving at a good speed again now. 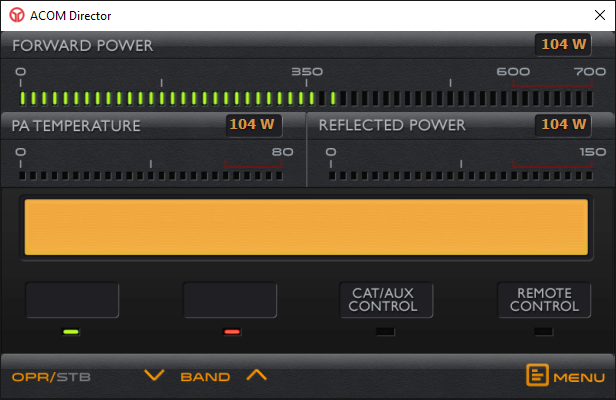 The ACOM600S protocol is now implemented along with a new user interface to match the look of the ACOM600S. I’m just working on unifying ACOM Directors own protocol so it can support both types of amplifier without having to use two different versions, once this is complete I will be releasing an alpha version so we can get any bugs ironed out of the basics before adding some of the more advanced features I’m wanting to include. My aim is to have a version released that you can all try out sometime in June. In the meantime, here is a quick video of the new user interface in test mode showing the operation of the new bar graphs. I’m pleased to announce that ACOM Director 0.8.0 is now available. Following on from the introduction of Logger32 support for frequency tracking in version 0.7.1, this version now contains support for DXLog integration to allow the ACOM 2000A to track the frequency of your radio for users of DXLog. Version 0.8.0 also contains many changes behind the scenes in preparation for support of other hardware being added in the future. Please note that this version is largely untested as I no longer have access to a real ACOM2000A anymore and rely on a “virtual” software emulated ACOM2000A for testing.